As farmers we should always be striving for improvement. Every year we need to work on doing things better than we did the year before. This year has been an extremely tough year for most South African farmers. The drought has been the biggest limiting factor. Many farmers were not even able to harvest a crop at all. This is very sad, but the only option is to dust ourselves off and start again. Farmers are extremely resilient, and many will find ways to start again and re-build. The key to bouncing back into production is not to suffer in silence. Remember that most farmers will be in a similar situation to you. Talk to your fellow farmers, talk to your agricultural representatives and talk to your extension officers. Discuss strategies and methods to be better prepared for future droughts. Learn from your mistakes and your neighbours mistakes in order to be better prepared for tough times ahead. How to strategise based on your observations in the drought? One thing that I observed during this drought year was that the people who were diligent about things such as weed control and general good practice still managed to produce a bit of a crop even with the small amount of rain that fell. Something is always better than nothing, especially when crop prices are high. It all comes down to moisture conservation. It is in dry times such as the year that we have just experienced that you can notice the immense impact that weeds can have on a crop. It is crucial to make sure that your spray programme is effective in ensuring this. Where weeds were prominent, crops were stunted and where weeds were controlled, many crops looked much better. Weeds are the biggest enemy of the crop farmer, especially in a drought. Another factor which I observed this past season was how much water is lost due to runoff. You might have noticed, especially in the western parts of the country, where in the low lying areas maize was always greener and grew much stronger. If your lands are uneven and poorly contoured, you can lose a significant amount of water due to runoff. We need to try and prevent this as much as possible. Every drop counts. Another factor which comes into play is fertilisation. This is a delicate matter as it requires a good understanding of climatic conditions in order to make vital decisions. During the drought you may have noticed some lands of maize that grew relatively well but did not produce any cobs or grain whatsoever. This may have been due to the fact that the farmer top dressed his maize before entering into a very hot and dry weather spell when the maize plant was starting to take strain. Sometimes we can place our crops under unnecessary stress when we apply fertiliser. If you believe that drought will prevail, it may be a wise decision to refrain from applying a top dressing of fertiliser until there has been significant rain and the crops are growing vigorously again. By doing this you may still have a chance to reap something as the plant would not have been exposed to that stress. Remember that if a plant is under stress and we apply top dressing, it will place it under further stress, but if the plants are growing actively and vigorously then the fertiliser will have benefits. Timing is everything. When driving around during the drought it is incredible to see the variation in crop potential from one plot of maize to the next. Apart from weed control, much of this is due to cultivar selection. 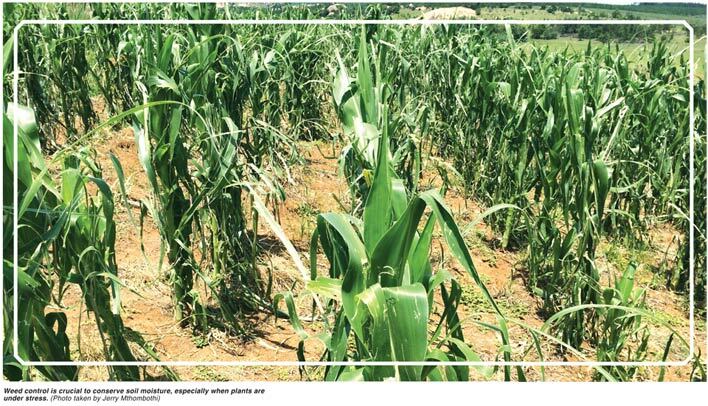 Some cultivars of maize cope better in drought than others. This is why it is important to keep in communication with the different seed representatives and to attend farmer days where they look at trials of different cultivars.Keep your finger on the pulse of cultivar development. There are a number of seed companies that are on the verge of launching official drought tolerant cultivars. When speaking to different farmers about their concerns over the drought, many will tell you that they are afraid of the threat it places on food security and food prices. This is the ultimate concern. Farmers need to continually be working on improving their methods of production and management, not only for their own business sakes but also in order to feed the nation. Drought years will come again and we as farmers need to be adapting, improving and learning from the tough years in order to do better in the years ahead.